Throughout the series, we use the nonprofit, Tahoe Silicon Mountain (TSM), as an example. Garrett and I were part of the founding team and have been running it since 2010. Getting the word out can take many forms, depending upon your target audience. In this post, I’ll cover ways to reach a broad audience through both online and offline channels. For example, I provide tips on hanging flyers at the most common bulletin boards around town. While this general strategy might work for you, if your meetup is more specialized, like a book club, then you’ll want to hang flyers wherever book lovers frequent. Asking at the local bookstore and library would be a good starting place. Before choosing your communication methods, you’ll want to think about the people who might be interested in attending your mountain town meetup. See Part 2 – Meetup Basics for more on figuring out who might be interested in attending. Once you have a good understanding of your potential attendees, then you can make a plan for getting the word out. Doing every item in this post doesn’t necessarily mean you’ll reach your audience. And, doing every item might mean that you spend a lot more time than is necessary for promotion. Before starting any promotion, evaluate all the channels available and choose a few you think would work to best reach your audience. These days, anyone can easily create basic flyers without being a graphic designer. It doesn’t have to be perfect and probably won’t be. And that’s OK! You’ll need to have 7 basic pieces of information, plus anything specific to your meetup group. Why – Network with entrepreneurs and professionals in the Truckee-Tahoe region and learn something new about technology, startups, entrepreneurship, local businesses, our communities or the environment from our monthly guest speaker. Young children are welcome to attend with their parents. Middle and high school students are frequent attendees and always welcome to participate. Canva, which has lots of great-looking templates and the option to purchase inexpensive stock photography to add to your flyer. Also great for social media assets! Piktochart has lots of nice printable templates and can be used for PowerPoint presentations and infographics. This list was created with suggestions from the Truckee-Tahoe Facebook Group. What platform(s) you choose will depend on the type of event you’re promoting and the community you’re building. For example, if you’re creating a meetup for photographers, you’d probably choose Instagram, Facebook, and Meetup.com. Since Tahoe Silicon Mountain is a group for professionals, we chose LinkedIn, Meetup.com and Facebook for getting the word out. We also use other platforms like YouTube, Twitter, and Slideshare, but they aren’t our main mode of recruitment. Multiple platforms can be time-consuming to maintain, so make sure you don’t over-commit. Decide if it makes sense to create a Facebook Page or a Facebook Group. Both Pages and Groups have the capability of creating Events, but they differ in how you can interact with your membership. Groups are better for discussions, while Pages are best for blasting information out (and putting ad dollars behind your posts). 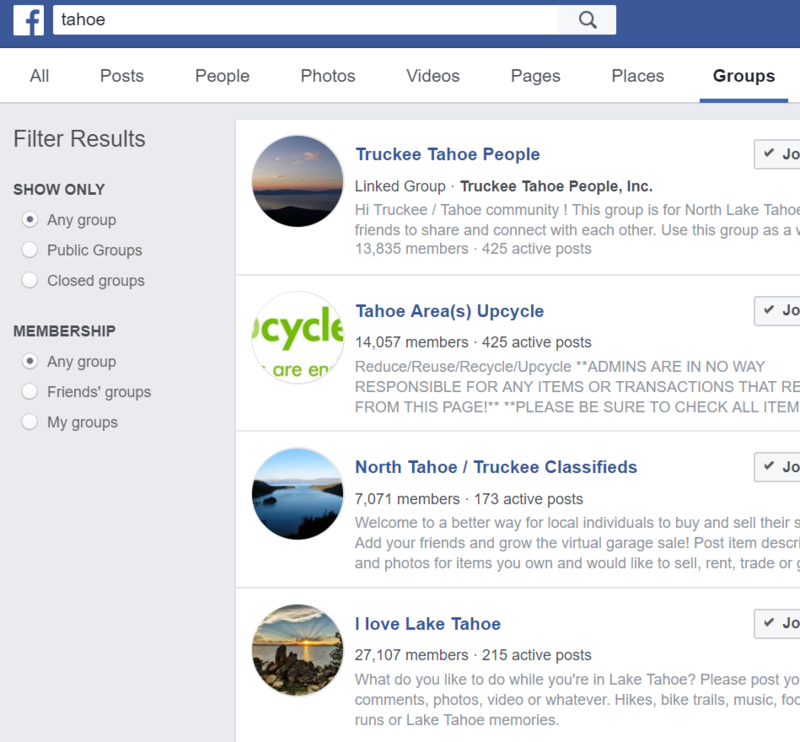 The Lake Tahoe and Truckee area has a lot of Facebook Groups that allow you to connect with other locals and share events. The main group on the North Shore is Truckee Tahoe People. If you only share your event with one group, that’s probably the one. Make sure you search Facebook Groups for Tahoe and Truckee and see what comes up. There might be a group already established that would love your meetup! Make sure to read the guidelines for each group before posting. For most groups, having more than one way to get in touch with members is essential, and email is a channel that works for almost anyone. MailChimp is a free and easy-to-use email marketing provider. Collect emails at every event. It’s easiest to collect them electronically so that you don’t have to try to read handwriting. Ask your social media followers to join your email list. MailChimp provides a sign-up link for you to share. Ask your members to forward your newsletters to friends who might be interested. Make sure to add a sign-up link to each newsletter. If you use a Facebook Group or Meetup.com, provide your email marketing sign-up link in the questions people will need to answer before joining the group. An email list isn’t worth much if you don’t email your members about upcoming events or topics of interest. Your email schedule will depend on how many events you’re holding and how time sensitive the information is that you’re sharing. For Tahoe Silicon Mountain, we have 3 monthly meetings and send 3 emails per month. Since Mountain Minds Monday is our biggest event with 50-60 attendees (and sometimes 100+), all of our promotion revolves around the timing of that event. With more volunteer time, we could split up our email list and have a similar structure for all of our monthly meetings. Lots of people new to an area turn to Meetup.com to find out about local events. For Tahoe Silicon Mountain, we found that Meetup was most useful for attracting new members. Typically, people who find us through Meetup are brand new to town. We don’t currently use it for regular communication – just specific event announcements for people who found us through that channel. For anyone who shows up to an event, we’ll collect their email address, so that they can receive all of the pertinent information by email – like details on event speakers, special programs, sponsorship opportunities, etc. The local newspaper can be the heart of a mountain town. It’s important to understand who your paper targets (locals or visitors or both) in deciding whether you should send a press release. And if you’re in Truckee, this seems to be constantly in flux! In Truckee, the main papers are the Sierra Sun and Moonshine Ink. The Sierra Sun is our (currently) weekly newspaper that is great for sending press releases for our largest monthly events. Moonshine Ink comes out every few weeks and typically has longer-form and more in-depth articles, so it is best to approach them if we have a story in mind. We don’t typically have the press releases for our regular events done far enough in advance to meet their press deadlines. These are the big two newspapers that target locals, but there are other publications as well. Do your research and make a list that you can easily reference for each press release. Tip: You can usually find the editor’s email addresses on the bottom of one of the first couple of pages of the printed paper. Don’t forget about word of mouth! If you’re excited about your meetup, it’s easy and natural to talk about it, whether you’re on a chairlift or out and about running errands. This is how Tahoe Silicon Mountain got off the ground and is still a part of how we grow. If someone is interested, I always ask for their business card and permission to add them to our email list. We also may use additional channels, depending on the speaker’s topic for our Mountain Minds Monday meeting. For example, when we had Dan Rubin, the General Director of System Engineering for Union Pacific, fly out from the Midwest to present, the Truckee Donner Railroad Society both facilitated recruitment of Dan and spread the word to their membership. Another example is when we had Tara Radniecki and Chrissy Klenke come from the DeLaMare Science & Engineering Library at the University of Nevada, Reno to present: “Beyond Books: How Libraries of the Digital Age Can Foster Innovation and Entrepreneurship,” we made sure that local and county librarians were aware of the event, and if they were too far away, knew about our livestream and event archives on YouTube. When we had Truckee Roundhouse board members, Morgan Goodwin and Steve Hoyt present “How You Can Be a Change Agent: Learn from the Creators of Truckee’s New Makerspace,” they were able to reach out to their members and prospective members to ask them to attend. Each event for us likely means a different method of promotion and communication and it’s useful to think about the outreach before running down the same list, event after event. At the event, ask people how they found you and use that information to decide which channels to pursue in the future. You can also ask your members where they think you should spread the word. There are a lot of possibilities for how you can promote your event or meetup. Start small, repeat what works, and every so often, try a new channel!